The main difference between the top two performance versions of the Tesla Model S is simply 5 kWh of energy capacity. Tesla used to offer the Model S P85D, a performance (P) Model S with a 85 kWh battery pack (85) and dual motors (D). The vehicle’s top performance mode was called ‘Insane’. The automaker later introduced a new version, the Model S P90D, which is the same car, but with a 90 kWh battery pack. 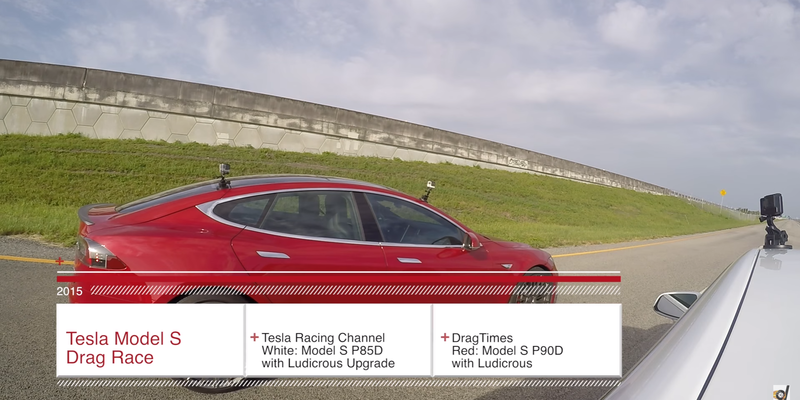 When introducing the new pack, Tesla also introduced a new performance mode, ‘Ludicrous’, which is obviously better than ‘Insane’. To enable the Ludicrous mode, Tesla needed to make two improvements to the electronics of the battery pack. It is available at the purchase of a P90D and installed directly on the pack at the assembly, but since it was introduced just a year after Tesla came out with the P85D, the automaker offered the upgrade as a discounted retrofit to P85D owners who just saw their new car get outshined by the latest version. Which means that Tesla’s fleet now has both Model S P85D with Ludicrous mode – with the battery upgrade as a retrofit at the service center – and Model S P90D with Ludicrous mode. Now we get to see both cars, DragTimes’ P90D and Tesla Racing Channel’s P85D, race in an almost perfect illustration of the difference 5 kWh can make. Tesla also makes regular small engineering changes to the Model S on a weekly basis. Tesla CEO Elon Musk once said that Tesla can make up to 20 small improvements to the vehicle in a week – so there could be some other differences between the two vehicles. Though the thing that will affect the acceleration the most is the state of charge. Both cars were fully charged with Maximum Battery Power enabled.